If you’ve been looking to step up your NLHE game, you’ve probably heard of the latest software advances for studying game theory optimal play, particularly PioSOLVER. Before you plunk down $1K+ for the package, though, you might want to learn a little more about what GTO means and how the software works. PlasticElephant on the 2+2 forums posted a YouTube video from Alex Goulder in a News, Views, and Gossip thread the other day that’s helpful in learning about the subject. Watch the video and read the comments for extra enlightenment. 845 players ponied up the $1,675 to play the WSOP Circuit Main Event at Planet Hollywood a little over a week ago to play for the $1.27M prize pool, and only 6 of the 90 players who made the money were from the Pacific Northwest, but three of them made the unofficial final table, with Bellingham’s Harjinder “Sunny” Gandham placing 10th, Danny Elmore of Sherwood coming in 8th, and Vancouver, Washington’s Ali Imsirovic making it all the way to 4th place. It was the second WSOP cash for Elmore and Gandham (and Imsirovic’s 4th), with all cashes for the three players coming this year. A bit of a downswing week for me, with six bricks in the Ignition Casino Thousandaire Maker. The last couple were particularly brutal, when I flopped bottom set on my sixth hand and ran into top set Sunday night, then sat through an hour of crappy hands only to get K♠J♠ in the small blind just before the break, have everyone fold to me, and jam my 12bb into the big blinds’s A♠A♣. Saturday’s Portland Meadows $30K GTD went about the same for me. I slowly slid downhill until just after the first break, busted, re-entered, then two hands after I get re-seated, I make a play with Ax8x from the small blind, flop top two pair, get most of my chips in on the turn, and put the rest of them in on the river only to have JxJx call me down to river a set. At least nobody can accuse me of slowplaying that one. 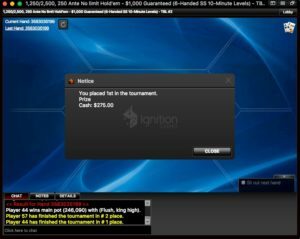 I played a number of Ignition Jackpot Sit-and-Gos, won a couple of the 5x payout $15 entry games, crushed a couple of PLO and PLO8 tournaments until I didn’t. 46 tournaments (32 Jackspot SnGs, they only last about 10 minutes, tops) and four online cash sessions. Would have been more, but Thanksgiving, you know? I’ve been meaning to update my codes for entering hand histories for a while. There are surprisingly few options for typing cards into the WordPress content management system used by nearly everyone on the Internet (event the WSOP uses a customized version), but there are only a few freely-available tools out there and most of them haven’t been updated in years. The one I’ve been using is Cards poker, developed by the French player Hesiode, but the last update is more than four years old, an eternity in both poker and internet terms. So I finally got around to modifying Hesiode’s code, replacing the bitmap images with text and icons that should make everything cleaner and easier to read. Down at the WPTDeepstacks Championship at Thunder Valley last night, Angela Jordison got heads-up in the $10K GTD Omaha Hi-Low tournament. Prolific poker author Lee Davy writes this week in an otherwise unrelated piece on cryptocurrency and airlines for CalvinAyre.com that “I’m stuck in the world’s smallest queue waiting to check in for a flight from Burbank to Portland.” He has his 13-month0old daughter with him (likely not a poker trip), and another article posted the same day mentions he had his first Thanksgiving dinner in the US last week. So…Portland relatives? Other than the final tablists at the WSOP Circuit, how did other PNW players do this week? Well, Dan martin from Klamath Falls cashed three times at the RUNGOOD Poker Series in Tulsa, including 1st place in the $100K GTD $675 Main Event. Washington’s Rafael Reis got to 5th at the Seminole Hard Rock Rock ‘n’ Roll Poker Open’s $250K GTD Event #6. Seth Davies made it into the money down in Punta Cana in the Dominican Republic, with a 55th place in the partyPoker Millions $5M GTD Main Event. 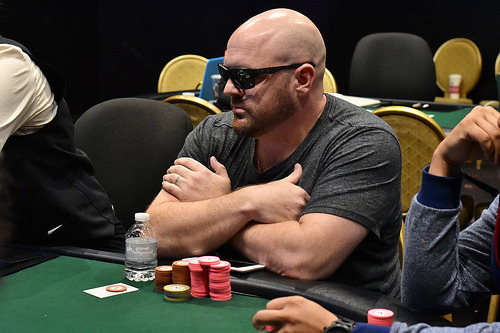 And Dan Barker from Poulsbo notched a first-place finish at a Venetian Deepstack Extravaganza IV $25K GTD Rebuy, for his largest-ever recorded cash; he took down a similar event this summer at the Venetian. In 7 months we’ve been tracking PNW @TheHendonMob leaderboards, @Mawkswell has moved up the Oregon list from 40 to 15. This week he’s 14. 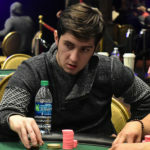 Max Young was profiled in an article Tuesday at PokerNews, along with a couple of other up-and-comers. 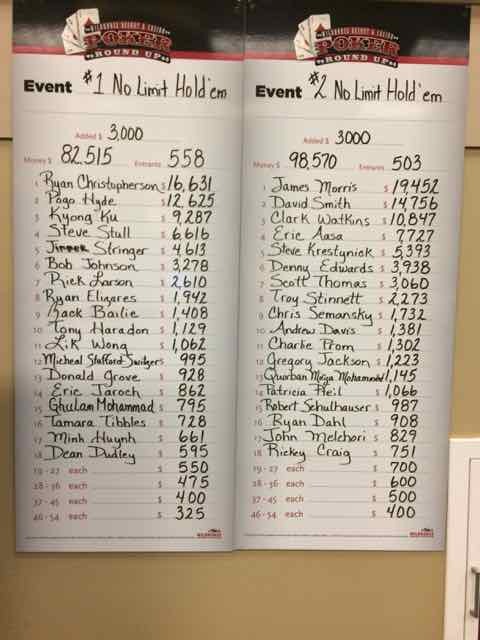 Final Table has a $50K GTD NLHE tournament Saturday at noon. $160 entry with a $160 live rebuy, and $80 addon. Pre-registration started Monday. Omaha shootouts are becoming more popular at venues like Rialto and Claudia’s, which is a good thing for those of us who pine for the old Portland Players Club mixed games. I haven’t had the chance to check them out myself, but I hear Friday and Saturdays are the times. I heard from David Long on Saturday that Claudia’s 7pm tournaments are switching over to Omaha as of next Monday, so check with them. The WPTDeepstack Championship is running at Thunder Valley. Thursday is the last entry day for the $560 $100K GTD Action 8 tournament; Saturday and Sunday are entrys for the $1M GTD $2,500 buyin Championship. This weekend at the WPT Five Diamond at Bellagio in Las Vegas will hopefully be a bit calmer after Tuesday’s poker cage robbery (the guy didn’t even wait for the big money to get into town). There are $25K buyin High Roller events Thursday and Friday, and satellites to the Five Diamond all weekend ($10,400 entry). Day 1 is Tuesday. 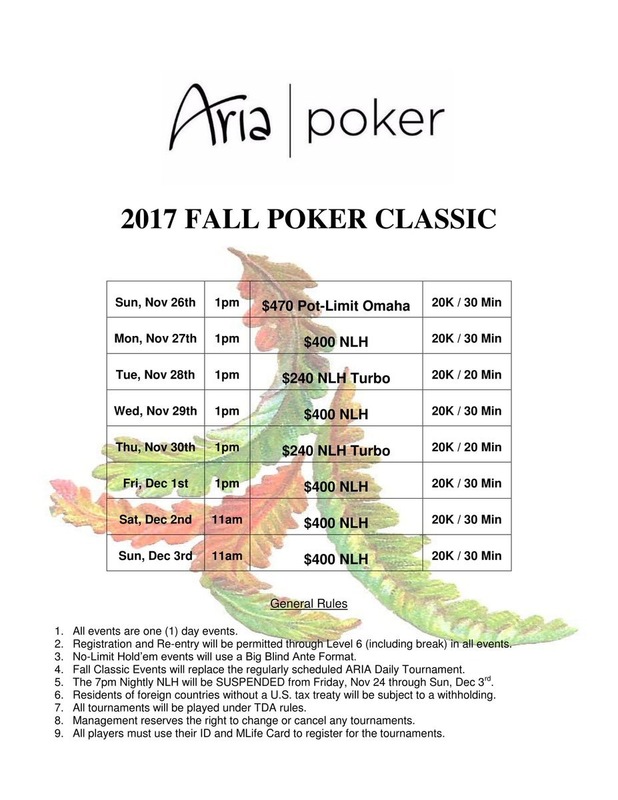 The Aria Fall Poker Classic runs thoroughSunday, with a $250 buyin Turbo event Thursday, and $400 buyin tournaments Friday through Sunday. The Wynn Signature Weekend starts today with a $25K GTD Seniors tournament, followed by three days of entry into a $600 $250K GTD tournament (Thursday through Saturday, with Day 2 on Sunday) and a $2.5K Survivor game on Sunday at noon for the save ($300 entry). Back in Missouri, it’s HPT St. Charles, with a $100K GTD event starting Thursday (three entry days), a $500 entry Seniors Championship next week (7 December, Pearl Harbor Day), and the $2,500 entry HPT Championship Open starting 8 December. Last year’s Championship (held at Thunder Valley) had a $500K GTD prize pool of more than $900K. This year there’s no guarantee. One-way flight that Friday to St. Louis International (just a few miles from the casino) is about $220. The last West Coast WSOP Circuit stop is at the Bicycle Casino in Los Angeles. It gets under way on Friday with a NLHE Bounty Ring event, then there’s a $300K GTD $365-entry Ring tournament the first weekend of December. The Main Event ($1,675) starts 9 December. The Ontario Poker Room Veterans Fundraiser is Saturday. Sunday at 2pm at Eugene’s Beach Poker Club is their $135 buyin Monthly Big Tournament. 30-minute levels and a catered lunch. Call early and register for bonus chips. Monday is the beginning of the Venetian December Extravaganza. The first event is a $400 buyin $40K GTD, and Tuesday is the first entry days for a $600 $150K GTD tournament. The $3,500 Card Player Poker Tour $500K GTD starts next Friday. The Medford Poker Room Holiday Tournament is 8 December. The Muckleshoot Tournament of Champions will be held Sunday, 17 December at noon. It’s $400 for any open seats if you have not otherwise qualified. #PNWPokerCal Planner for 23 November 2017 — THANKS FOR PORTLAND POKER! What am I grateful for? Rake-free Portland poker clubs and especially the players who volunteer to deal because my ability to shuffle and deal is crummy.. Safe travels and best wishes for your holiday weekend (and before you head out to your regular game on Thursday, call your club to see if they’re closed!). 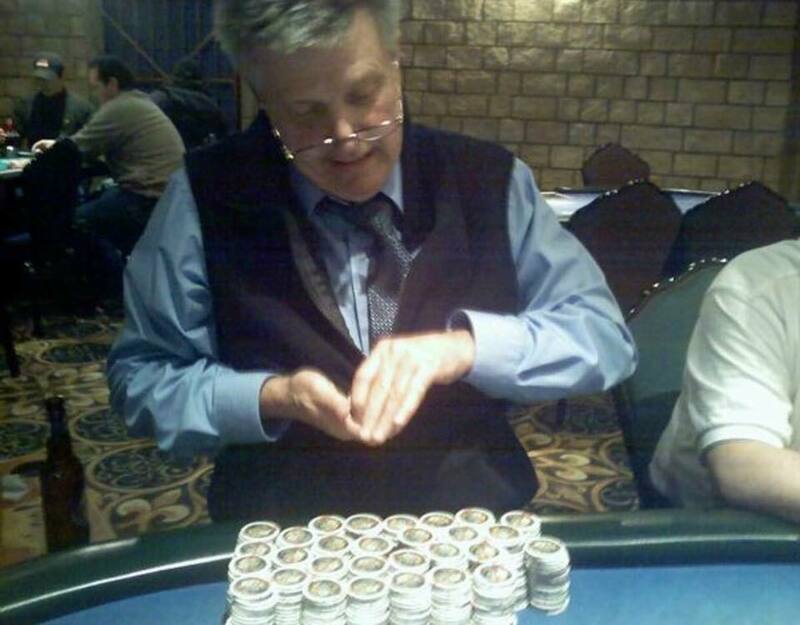 According to a post on the NW Poker Facebook group, former La Center card room floorman Ernie Haugen passed away last week. According to Kasey Sutton, a viewing is scheduled for 1 December at Longview Memorial Park, with another viewing and service on 4 December. See the post for details and to leave remembrances. Out on the east side of the state, the Ontario Poker Room is putting on a potluck fundraiser tournament for veterans of Oregon and Idaho on 2 December at 1pm. Buyin is $60 with unlimited $10 rebuys for the first hour and a $10 addon. Prospective players are requested to RSVP by 29 November. On 9 December at noon, Medford Poker Room is having their $120 buyin Deep Stack tournament. They also suggest you reserve your seat. The 12th Annual Northwest Deaf Poker Tournament returns to its new home at Portland Meadows Poker Room, 23 & 24 February, 2018 with three tournaments (one on Friday evening and two on Saturday). See the Facebook announcement for more info and contact information. A decent week overall here at Poker Mutant Central. Not a Max Young kind of week, but decent. 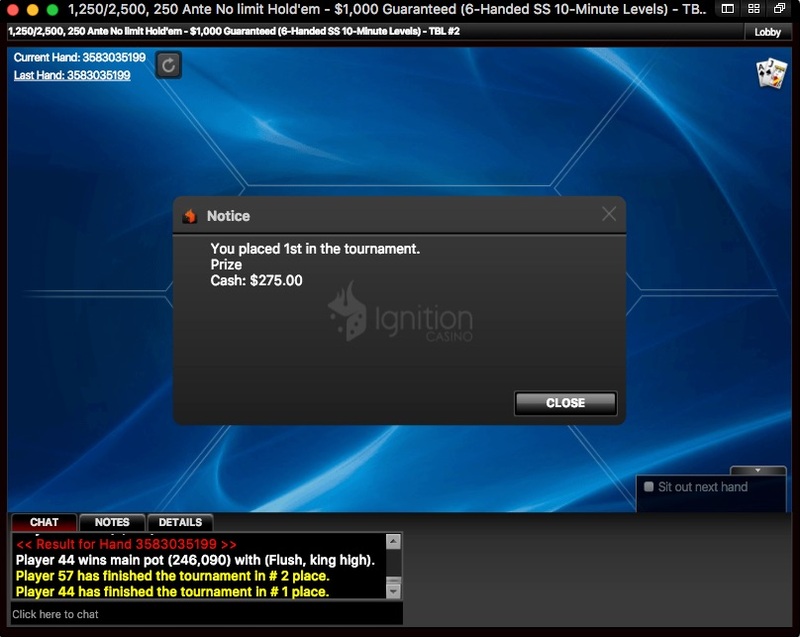 I cashed in last Wednesday’s Ignition $5K GTD Thousandaire Maker (falling a little short of the Thursday game and not getting anywhere in Saturday’s or Wednesday night’s). Dropped a little money in the PLO cash games there, then took a whack at the Jackpot Sit & Go Ignition has begun to offer, where you play a 3-person game that has a variable payout, from double the buyin to 1200 times the buyin. So far I’ve played 11 $7 jackpot games. Most have had $14 payouts—one had a $35 payout—and I’ve won 6 (but not the bigger one). I’ve also played 11 of the $15 Jackpots (two of which were $75 payouts), and cashed six of the standard $30 pots. Friday night, I was in a five-way chop at Final Table’s $10K GTD, with everyone getting between 3rd place and 2nd place money. 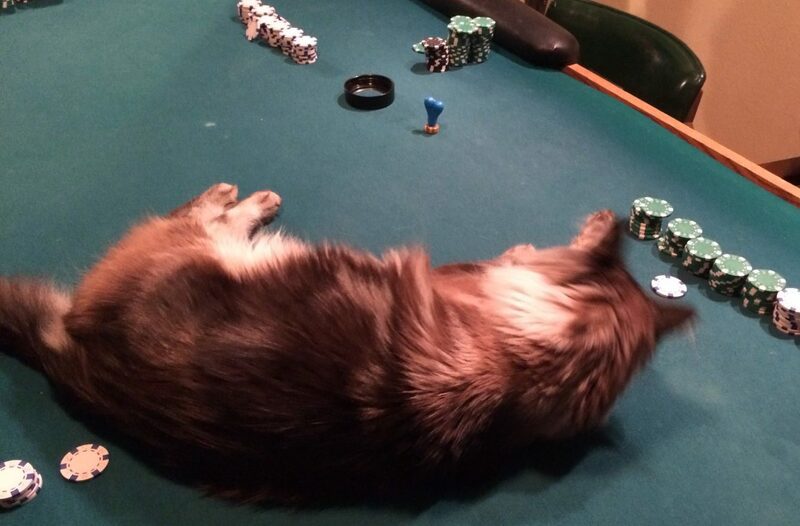 Monday was my long-time home game (where I met Jim-Jim the Poker Cat); I dropped two buyins, busting the second time just before break, then headed over to The Game for some 1/2 NLHE. I waited about an hour before I got a seat at a new table, then left an hour later after playing back against the reckless straddler who sat on my left resulted in a double-up. The Wildhorse Fall Poker Round Up puts lots of big numbers up in the leaderboard this week as the results hit Hendon Mob. Brian Son of Meridian, Idaho is the big name in the new money. Going into November, he had two small cashes recorded, but he hit the money three times in Pendleton, taking 4th place in both the Shootout and the Main Event. Matt L’Hommedieu has exactly one recorded cash, but it was for 2nd place in the $330 Friday night tournament just before the Main Event. Colfax’s Ryan Christopherson had just a min cash from this summer on his record before winning Event #1. Mel Hoelzle came from Boise to pick up his first cash, a win in Thursday’s Event #9. Pogo Hyde from Salen opens his Hendon Mob page strong with 2nd place in Event #1, and Douglas Reiper bested his only other cash by a factor of twenty, taking second place in the High Roller. Out at Mid-States Poker Tour Denver Poker Open, Jason Beasley won the Main Event, Beasley lives in Colorado now, but he’s from Salem (and his Hendon Mob entry still lists him from there). Even farther away, Calvin Lee (Mercer Island) won the 2017 Japan High Roller Festival Main Event (Japan only recently legalized casinos, so national poker championships have been held elsewhere, much like the Norwegians hold theirs in Dublin). It was a good series back in Pendleton for Idahoans, with Twin Falls’ Michael York taking first on the Main Event, after making the unofficial final table of Event #10 the night before and cashing in Event #9. And, from Boise, David Smith took 2nd in Event #2, 21st in the Seniors, and 3rd in the Main Event. Wait til you're old enough to play Seniors tourneys. Rule 1) Any ace is good for at least 10x open; Rule 2) Pairs are hard to make, so pair under the flop must be good. 2nd-place Main Event finisher Dale Dietzel (Gates, Oregon) blew out his previous cashes and picked up 13th in Event #10. Angel Iniquez grabbed first in Event #10. James Morris of Seattle took the bracelet in Event #2, Jason Heiner got 10th in #10 and 11th in the Main, Carl Oman was the winner of the High Roller, and David Mallet won the Seniors. 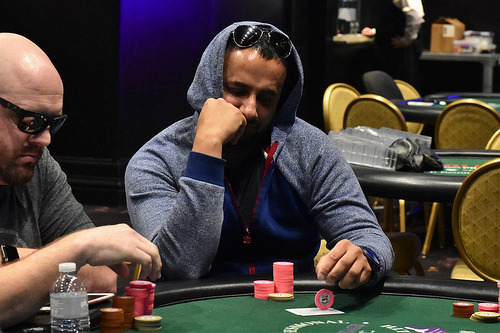 Seattle’s Alexander Fitzgerald went deep at WPT Montreal, cashing 22nd of 606 entries. Clark Watkins double-dipped in Event #2 at Pendleton (2nd) and #10 (23rd). And congrats to Astoria’s Troy Stinnett, with three cashes including two final tables (20th in the Shootour, 8th in Event #1, and 3rd in the High Roller)! Lappin: That’s (not?) a good ROI. Lappin: A Chip Race exclusive. Laak: And…maybe it’s some Freudian, weird, dark thing, but I don’t look at it, I don’t want to look at it, I have no urge to look at it, I know it would be relatively easy to look at it. I am…I collect the data and then I don’t analyze it. In other podcast news, Limon was a guest on the Part Time Poker podcast the other day, He’s always worth a listen no matter where he shows up. You can turn it off after he’s gone. The Tulalip Poker Pow Wow coming up in January has a couple of odd mixed game tournaments in it. The 4-game mix is PLO, PL Hold’em (PLH), PLO8, and PLH8 (Pot Limit Hold’em 8 or Better). That last one’s pretty strange, but the 2-game Mix is PLO8 and something called Pot Limit 5 Card Holdout. When my far more experienced poker traveling companion David Long and I were out in Pendleton the other week, I asked him if he’d ever heard of such a thing. Was it some oddball term for Big O? I mean, there’s five cards. He said he hadn’t heard of it, but having designed games of various sorts over the years, I was curious what it was. It’s something being promoted by Omega Gaming USA, apparently. There’s a brief Reddit thread about it, but a more detailed description in the State of Washington Gambling Commission‘s letter of approval to Omega (which is addressed to Marysville, home of Tulalip Casino). Small and big blinds are put out, as in Hold’em. There is a round of betting (pot limit, starting to the left of the big blind). Players discard up to four of the cards in their hand, starting to the left of the button. All of the cards remaining in the player’s hand must play. 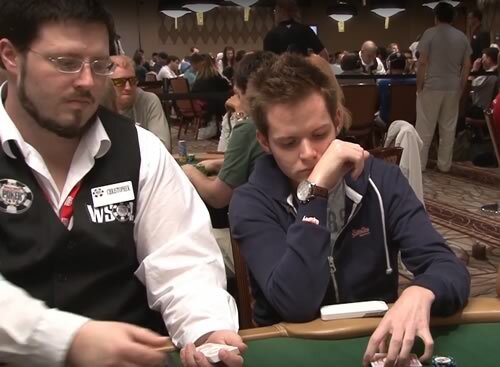 If more than one player remains, the dealer burns a card and turns over two cards for a flop. Remaining players bet, call, or fold. If more than one player remains, the dealer burns another card and turns over two cards for the river. If more than one players remains, there is a showdown. The twist to this game is that your five-card hand must include all of the cards you keep, plus enough of the four cards on the board to equal five. If you keep one card, you are playing all four cards from the board. If you don’t discard anything, you don’t get to use any of the community cards. If you discard two, you use the three in your hand and two from the board. Running some sample hands for a couple of hours, it felt like the game had aspects of draw and stud games, as well as Omaha. I’m not likely to get a chance to play thr tournament since it’s midweek—and I’m not about to give away the strategic insights we came up with (except that players keeping four cards are very likely to make their flush)—but I am going to keep a look out for any chance to play it. Final Table announced a double guarantee for their Friday morning (11am) tournament just after I posted this week’s Planner. The $10K GTD for Friday night is also confirmed. Saturday at noon is a big $30K GTD at Portland Meadows! UPDATE: Sally Jean at Room 52 says on Facebook they will be open Thanksgiving night from 8pm until 2pm for 0.50/1, $200 max! See their post for availability. UPDATEDER: Also too late to make the original post (guys, you know I usually write these by Tuesday night, right?) Heath Bloodgood announced a $50K GTD tournament ($160 buyin with 1 live rebuy, $80 addon) at noon on 2 December. Pre-reg starts Monday. I haven’t seen any announcements for specials on the day after Thanksgiving (there should be a $10K GTD at Final Table at 7pm, as usual), but Saturday at noon is a big $30K GTD at Portland Meadows! See you there if I’m not in some turkey-induced coma. There’s a flurry of games over the next three weeks but a big gap in poker series activity (nearby, but there’s always Prague) starting in mid-December. So get your money in now! It’s the last weekend of the Venetian Deepstack Extravaganza IV in Las Vegas. Friday and Saturday have $340 flights for a $100K GTD tournament (finishing on Sunday), and there are some smaller events, including a $7K GTD Omaha Hi-Low tournament at 2pm Friday. The Venetian December Extravaganza starts 4 December; its centerpiece is the $500K GTD Card Player Poker Tour DoubleStack ($3,500 entry) on 8 December. The WPTDeepstack Championship starts Friday at Thunder Valley. It opens with a $560 $100K GTD and closes with the $2,500 buyin $1M GTD championship next weekend. Friday is the start of the WPT Five Diamond at Bellagio in Las Vegas. There are more than two weeks of tournaments (culminating in the $10,400 buyin Main Event) with a number of them at the $1,100 level. The first is just $560! Saturday features the first of two shot clock tournaments, there’s a Seniors game and PLO on Monday, and $1,620 NLHE 6-Max on Tuesday. Why do I have a job? The last Sunday in November is a Deepstack tournament at Muckleshoot Casino. $300 buyin for 25K in chips, starting at noon. It’s a qualifier for their Tournament of Champions (17 December): free entry to the TOC for the winner, $250 for anyone who qualified by playing 5 TOC qualifying events and scored enough points, and remaining spots go for $400. Now they tell me. The Last Sunday of the Month tournament at Tulalip is an $820 buyin with a $75K GTD. 11am on 26 November. There’s a satellite ($90 buyin) on Saturday at 3pm. Sunday is the opening event of a smaller Las Vegas series, the Aria Fall Poker Classic, which kicks off with a $470 buyin PLO tournament. The other events in the week-long series are NLHE and they’re a mix of $400 and $240 buyins. The Wynn Signature Weekend starts next Wednesday with a $25K GTD Seniors tournament, followed by three days of entry into a $600 $250K GTD tournament (Thursday through Saturday, with Day 2 on Sunday) and a $2.5K Survivor game on Sunday at noon for the save ($300 entry). Back in Missouri, it’s HPT St. Charles, with a $100K GTD event starting next Thursday (three entry days), a $500 entry Seniors Championship the next week (7 December, Pearl Harbor Day), and the $2,500 entry HPT Championship Open starting 8 December. Last year’s Championship (held at Thunder Valley) had a $500K GTD prize pool of more than $900K. This year there’s no guarantee. One-way flight that Friday to St. Louis International (just a few miles from the casino) is about $220. The last West Coast WSOP Circuit stop is at the Bicycle Casino in Los Angeles. It gets under way on 1 December with a NLHE Bounty Ring event, then there’s a $300K GTD $365-entry Ring tournament the first weekend of December. The Main Event ($1,675) starts 9 December. The Ontario Poker Room Veterans Fundraiser is 2 December and the Medford Poker Room Holiday Tournament is 8 December (see above). Results for all of the events at Wildhorse from last week have been posted, and they’re duplicated here. Entries were down for most events, despite the extension of the time for entry and re-entry. I don’t know what to make of that, in particular, though the series was up against two West Coast WSOPC events (Lake Tahoe and Las Vegas), a Venetian Deepstack Extravaganza, and the LA Poker Open overlapping either the entire series or one of the weekends. As mentioned last week, the 2018 Spring Poker Round Up dates are set for 5–15 April. After busting out of the Wildhorse Big O tournament last Tuesday, I played one of the final Ignition Golden Spade Poker Open events, the $15K NLHE 6-Max, making it about half-way through the field of 400, then jumped into their nightly $8K NLHE (338/815), a $2,500 NLHE Turbo (130/229), and a $3K NLHE 6-Max (31/48) before finally just playing some online 4/8 Omaha Hi-Lo and making a whopping $10 profit. Woohoo! I started off Wednesday morning with an online $1,500 PLO Hi-Lo, and when I didn’t get very far, I went down to the satellite room and played two $43 NLHE Satellites, busting in the first round on bullet 1 and pulling out a tricky comeback on the second. I was short-stacked through most of the game, then sucked out with QxJx against AxKx which managed to keep me alive into three-handed play, then I put a couple of brutal hits on the gentleman who was the big stack for almost the entire game and I ended up with two $100 vouchers for my entry into Event #7 NLHE Seniors. I wish I could say more about how the Seniors tournament went. I had a good start, I know that much, with about three times the starting stack three hours into the game, with about half the field remaining. I spent a good portion of the first part of the game sitting next to Thomas Schultheis, who was the series champion a few years back, and who’s medium-distantly-related to me by marriage. I went through something like six table changes during the course of the game—including ending back at the same seat in the middle of the room twice—and lost a third of my stack in a blind on blind hand to 2x4x just before dinner. We were in the money just before the 9pm (after a noon start and a 1-hour dinner break. Went for two more hours, getting close to the final table when I shoved AxKx and got called by 9x9x. The flop of JxJxQx gave me the dreaded too many outs, and I just missed the unofficial final table and a sparkly hat. The big stack in the picture above belonged to Hamid Siddiqui, who went out just before I did, after suffering some major losses following the two-table redraw. My High Roller experience the next day was short and ugly. I lost some chips early on, battled my way back to near starting stack, then picked up A♦2♦ in the big blind and called a raise along with three others. The flop was K♦6x4♦ and I called a bet, then an even bigger bet on the 2♣ turn (I was heads-up with the original raiser by this point). When the 2♠ came on the river, I stupidly though I was good with the trips, but my opponent had 6x6x in his hand and I was out after just ninety minutes. Congrats to my poker buddy Steve Myers for cashing 6th place, after arriving late because of a terrible wreck on I84 on the way out. I went on a little bit of a rampage (not the kind where you make money) after the High Roller bustout: dropped a buyin at 0.1/0.25 PLO on Ignition, Got to 30/130 in a $2,500 NLHE, then 45/84 in a 4K NLHE 6-Max. Went downstairs and bought into the 10/20 Omaha Hi-Lo game, was almost felted, got quads that brought me almost even, then ran it back down. And that was all mostly before dinner. After dinner, I went back to the room and bricked 6 tournaments, including the Thousandaire Maker. My poker travel partner, David Long, and I decided to head back to Portland Friday morning —we both had stuff crop up at home. I played some more online cash PLO, with mixed results, busted the Thousandaire Maker and a $4K NLHE Turbo, then min-cashed a 77-player $500 PLO8 Turbo. Saturday I played (and busted) three online tournaments, and lost a buyin at 0.1/0.25 NLHE Zone. Sunday, I was out of the Thousandaire Maker in two hands (he did have an ace; JxJx no good!) and a $5K NLHE, then there weren’t enough people signed up for the Thousandaire Maker to get it started, and I played a 6-Max (briefly) before doubling my buyin at cash PLO. That is all. Kevin MacPhee was over in Rozvadov last week, defending the title in the Main Event of the World Series of Poker Europe; he just missed making the final table after Maria Ho drew out to a king-high straight to crack his kings. The other big cashes for the week were down in Las Vegas at the Venetian Deepstack Extravaganza IV, where Darren Rabinowitz got 3rd place in the $200K GTD NLHE and Marco Garcia grabbed 2nd in a $100K GTD NLHE. Pendleton results hadn’t posted to Hendon Mob by Sunday when the leaderboards are run; hopefully they’ll be there by next week! Series are starting to thin out a bit before the holidays. The Venetian Deepstack Extravaganza IV weekend event is a $125K GTD tournament with a $250 buyin. 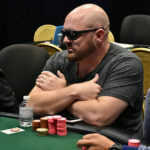 Each of the three entry flights (Thursday–Saturday at noon) plays down to 5% of the field (10% of the field is paid, with $400–$800 paid to the players who don’t go through to Day 2). Monday and Tuesday are entry days for a $400 buyin with $100K GTD. The LA Poker Open Main Event ($1,100 buyin, $500K GTD) has entry flights Thursday–Saturday (1px, 1pm, and noon, respectively). It wraps up on Sunday. The Lucky Chances 19th Annual Gold Rush finishes up this weekend with their $100K GTD to first place tournament ($1,080 buyin) at 9am on Saturday. The Stones $100K Quantum has started. There are entry flights at 10am Thursday through Saturday, with a 6pm flight on Thursday. Stones is also running a $1K buyin Single Table Sit & Go on 22 November. First come, first served. The last two Sundays in November mean the Big Bounty and Deepstack tournaments at Muckleshoot Casino. Both games start at noon on their respective weeks. The Last Sunday of the Month tournament at Tulalip is an $820 buyin with a $75K GTD. 11am on 26 November. The WPTDeepstack Championship starts the day after Thanksgiving at Thunder Valley. It opens with a $560 $100K GTD and closes with the $2,500 buyin $1M GTD championship at the beginning of December. Max Young continues to steamroll his way to the top of the World Series of Poker Circuita win in standings with Lake Tahoe. Fresh on the heels of a $120+K win at Parx Casino in Philadelphia (you can read about that here), the Lake Tahoe win is Young’s largest to date, and puts him over half a million dollars in recorded tournament earnings, with half of that in just the last three months. Structures for the events at Wildhorse Casino were never posted online, but they’re getting the results from the series online quickly, with about a 1-day lag. If you’re here in the poker room you can check out the posters on the wall, but it’s handy to have right there at your virtual fingers. Attendance numbers were down a bit in the first four events, with 20% and 15% drops for the Shootout on Sunday and Monday’s Omaha Hi-Lo (exacerbated perhaps by the closure of Interstate 84 between Pendleton and La Grande due to snow and a series of crashes Monday morning). No excuse for the Shootout, though. The Big O tournament on Tuesday pulled in 132 entries in its debut. That’s ten more players than the HORSE tournament that was in the Tuesday spot last year. Thursday was the first day of my little poker vacation. I did a couple of errands, then late-regged a small 6-Max and did rather well. Lost eight tournaments in a row, busted two satellites I’d won tickets for, lost a couple of PLO cash sessions and that was just before the weekend started. Between getting ready for the trip to Pendleton, doing stuff around the house and visiting with some relatives on Sunday evening, I played six PLO and NLHE Zoom cash sessions (profiting in five), min-cashed a small PLO Turbo tournament and played a $10K guarantee and a Thousandaire Maker. 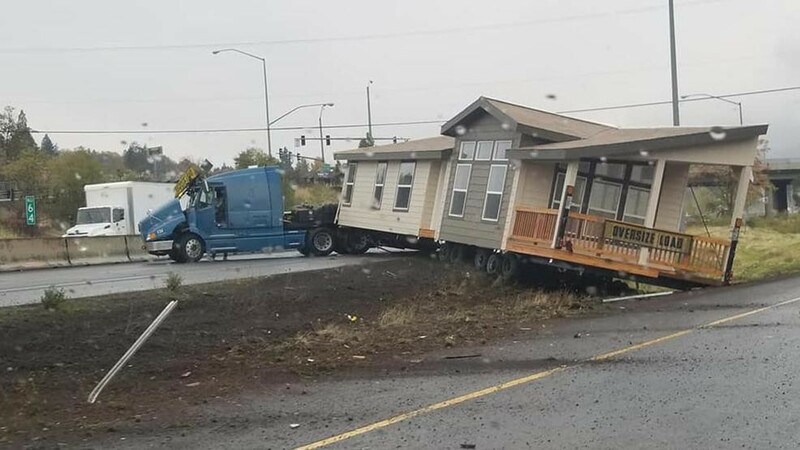 Monday was the drive out to Wildhorse through rain in the fire-scorched Gorge, past a jackknifed house in Hood River right up to where they had I84 closed. Then I jumped into the Omaha Hi-Lo tournament, never getting much above starting stack and lasting only three hours. Played a little PLO online, then it was back down to the tourney area for the NLHE High Roller Super Satellite. 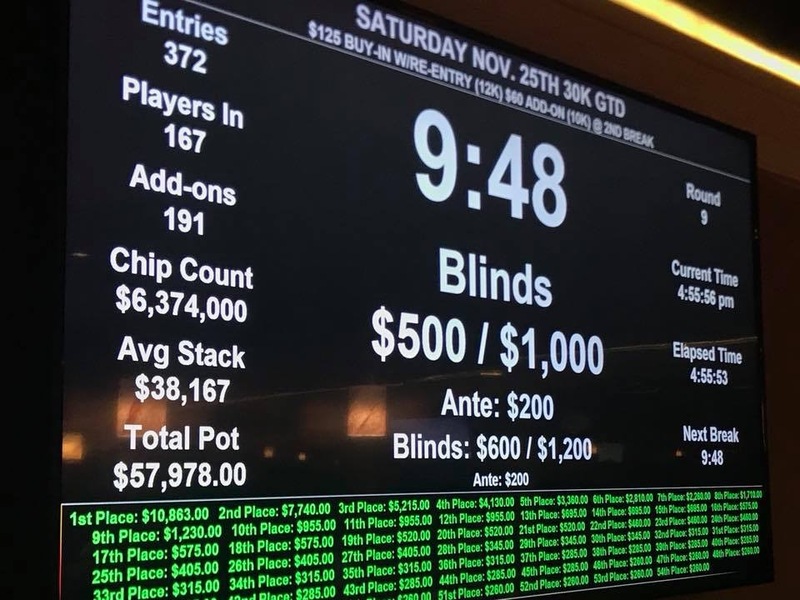 The Monday night satty got 37 entries, paying out seven $1K tournament vouchers (the full cost of the High Roller is $1,100, which means you pay fees on both the satellite and the actual entry). I’m not complaining about that though, because after a slow start, I was hitting sets left and right (without getting any large hands early on), then some well-timed pocket aces came through and I ended up eliminating the bubble player. 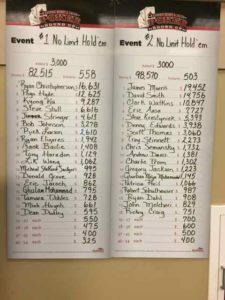 Tuesday’s Big O tournament went bad at first, then I went on a bit of a rush in the second and third levels, and I had well over twice the starting stack as we closed in on the break. Joe Brandenburg was two seats to my right and had a couple of hands go bad, including one where I turned a better full house. He was all in on the last hand before break, with me and another couple players contributing to his resurgence, then after the break he broke my big stack in two big hands. I made a bit of a rally, but was out after a couple more rounds. The 2018 Spring Poker Round Up dates have been announced: 5–15 April. Why is it always tax season or property tax season? What am I? Made of money? In case you’re unaware of Infinite Stacks, I suggest you take a look at this post from a couple of years ago. November’s Last Sunday of the Month tournament at Tulalip Casino is a $75K GTD $820 (including dealer appreciation) buyin with 30-minute levels. That’s at 11am on 26 November, the Sunday after Thanksgiving. 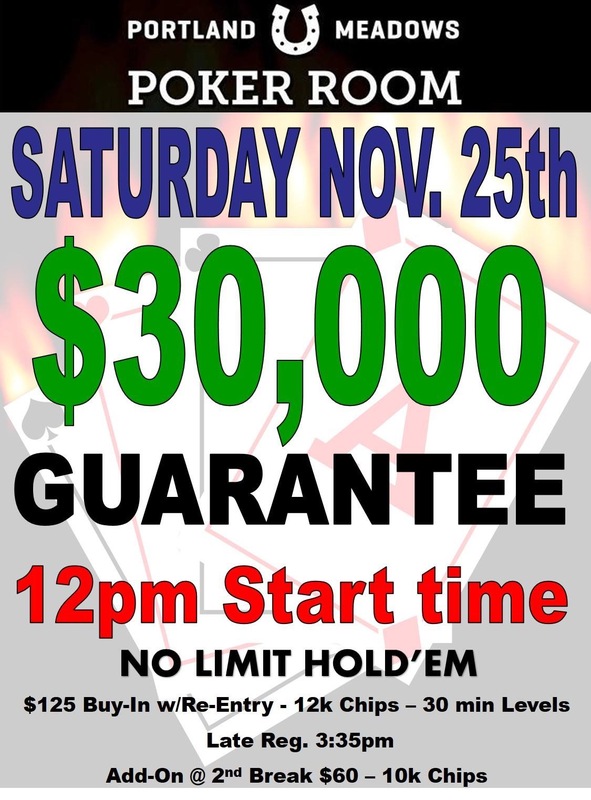 There are satellites to the LSOM running at 3pm on each of the Saturdays in November, with $90 buyins. Louis Schaffer from Portland hasn’t had Max Young-brand success the past couple of months, but it’s been pretty good. 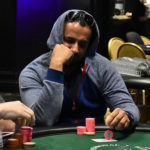 His first recorded tournament score was in September, when he made the final table of the Chinook Winds Fall Coast Classic Main Event, and he was back at the final table of a series Main Event at the end of October placing 6th of 326 at WPTDeepstacks San Diego, with a final table that included (and was won by) Upeshka da Silva. The WSOPC Lake Tahoe stop wasn’t just good got Max Young. Grant Denison of 2 Poker Guys came in 3rd in the Monster Stack event, as well (I’d include the other poker guy, Jonathan Levy—who was right behind Grant, in 4th place—but Jonathan’s Hendon Mob profile lists him a being from “Brooklynn, NY” (sic), and this leaderboard specifically says “Pacific Northwest” on it. Speaking of Grant and Jonathan…there’s new Poker Time. Believe me, they are being entreated to do a PLO session. 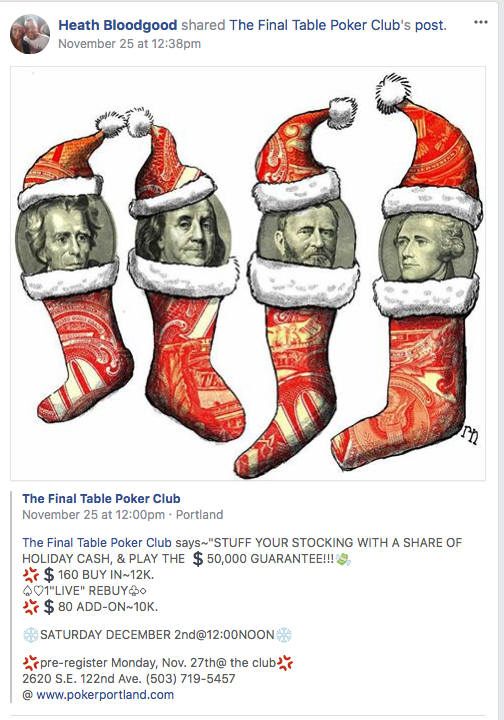 Does Portland Poker exist if I’m not there? Discuss. Seriously, though, there’s a double guarantee at Final Table on Wednesday morning at 11am. Double what? The usual 11am guarantee is $1,200. Mid-States Poker Tour Denver Poker Open Main Event, with an $1,100 buyin and $200K GTD has its first flight on Thursday at noon, with flights on Friday and Saturday at the same time. It’s a two-day tournament wrapping up on Sunday. At the Venetian Deepstack Extravaganza IV this weekend, there’s a $600 buyin $150K GTD tournament starting Saturday at noon, with a second flight Sunday. Next week is a $400K GTD three-day tournament with flights on Tuesday and Wednesday ($1,600 entry). The LA Poker Open has a $570 buyin Big O game Thursday, with mixed Omaha Hi-Lo/Stud Hi-Lo on Tuesday for the same price. Their Main Event ($1,100 buyin) starts next Thursday; there are entry flights at 1pm through next Saturday. Tomorrow at Planet Hollywood is the WSOPC Las Vegas opener, a $365 Ring event with six entry flights (noon and 4pm, Thursday–Saturday) and $200 GTD. The Main Event ($1,675) has $1M GTD and starts 17 November (next Friday). 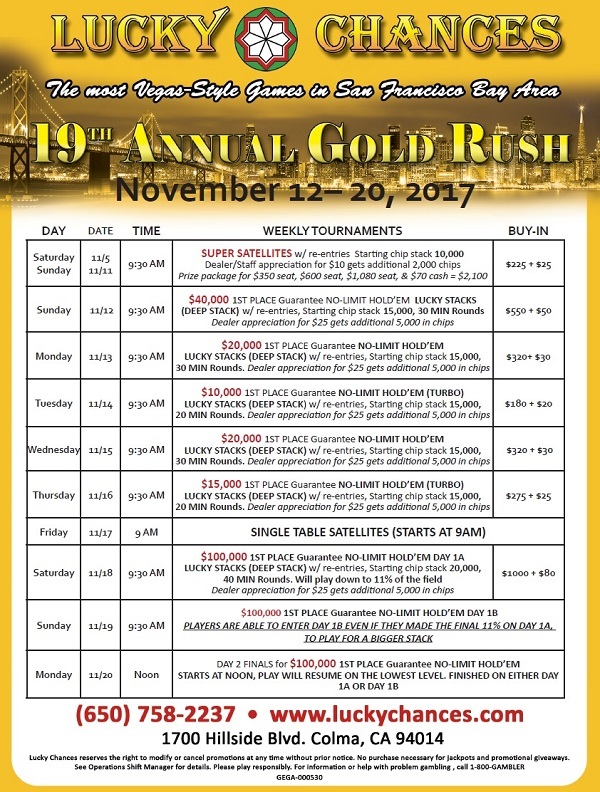 The Lucky Chances 19th Annual Gold Rush in Colma (south of San Francisco) starts Monday and features six events with 1st-place guarantees ranging from $10K to $100K for the Main Event ($1,080 buyin, starts 18 November). The Stones $100K Quantum starts next Tuesday. There are three days (five flights total) with $120 entry (gets you 10K in chips). 10% of the players from those flights advance to Day 2 (19 November). Friday and Saturday of next weekend (17 & 18 November) have 10am flights for $240 (20K in chips), with 20% of the field advancing. You can also direct-register on Day 2 for $900 and 100K in chips.You get $250 for qualifying for Day 2, and $900 for each additional qualification (with the biggest stack going forward). Howdy, poker peeps! It’s the last Planner before the start of the biggest poker series of the year in the Pacific Northwest, the Wildhorse Casino Fall Poker Round Up, which starts tonight! I was Planning (see what I did there?) to be there for the entire series, but some last-minute changes to schedules mean I’m going to miss the first weekend and, but save a seat for me in Monday’s Omaha Hi-Lo! Lots of stuff I could cover today, but I’m already a day late getting this done, and I don’t want to miss anything (though I invariably will), so let’s get to it. 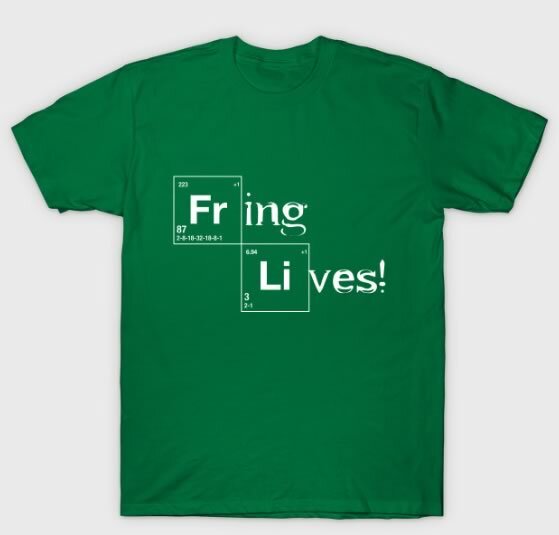 My Time Is Coming: Back From Hiatus? Back before I went off to work at the WSOP in 2016, I was doing a series called My Time Is Coming, running down the events I was playing each week, but it all got sidetracked by seven weeks of reporting in Vegas and a more-than-full-time job when I got back (plus I can barely keep up on the Planner each week). In case you hadn’t seen them, I wrote a couple of non-Planner pieces over the past month, a walk-through of the only Hyper Turbo event I’ve ever played, and some hand histories from a table in a Thousandaire Maker where I was seated with poker raconteur Carlos Welch. On its surface this might look like every other article about the ongoing Meadows/Oregon Lotto saga, but this might be the most interesting one yet if you read between the lines (doesn’t take much). In agreeing to the declaratory order process, Meadows and Oregon Lottery are teeing up the issue for judicial review by the Oregon Court of Appeals, so for better or for worse, looks like we might get some clarity. If the news is eventually bad, the good news is the Court of Appeals process could take a while, and it looks like Oregon Lottery agreed to keep the license open until they get a judicial ruling. Looks like the only issues are whether taking a door fee constitutes “house money,” and whether handling the chips constitutes a “house bank.” Obviously significant issues, as the model doesn’t make any sense if a court finds against Meadows on either issue. And as a number of people noticed, it doesn’t help WW’s credibility to run a clearly-marked photo of a Final Table table in a story about Meadows. Nice job, folks! If you want more to sneer about when discussing WW, head over to the Northwest Labor Press, which rakes writer Nigel Jacquiss over some unrelated coals (though I suspect they’d take a dim view of Portland poker rooms and volunteer dealers). Episode Six. Isn’t that Return of the Jedi? Benjamin Martin from Bothell grabbed 2nd place in the Venetian October Weekend Extravaganza $300 Rebuy a couple weeks ago, putting him on the Hendon Mob database for the first time with a good score. 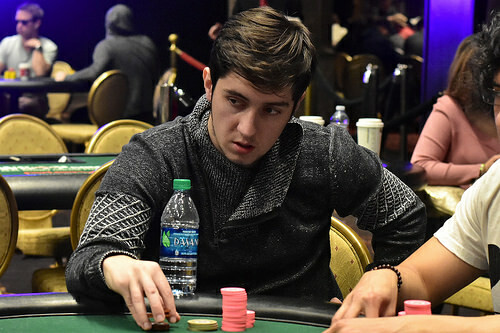 Big names making big money since last week’s report include Dylan Linde (11th in the Main Event at the WSOPC Chicago); and Tyler Patterson and Matt Affleck at the WPT bestbet Bounty Scramble in Florida, taking 14th and 25th, respectively. It’s the first week of the months and Friday is the First Friday, which means it should be a $20K GTD (a text message on Thursday says $15K GTD this month) at Final Table. 7pm, $15 door, $80 buyin with $80 live rebuy, and $40 addon. If shootouts are your thing, Micah Bell reports that there are “$1/2/5 Omaha mix game on Saturdays @ The Game starting around 7pm. 4 card Hi and 5 card Hi/Lo (Big O)”. November is Player Appreciation Month, so that’s cool. Now that Rialto’s back in operation, there are games there seven days a week, text or call 503-227-8147. All eyes will be on the East! I’m not absolutely sure there will be a Planner next week, but I’ll try to get it done. 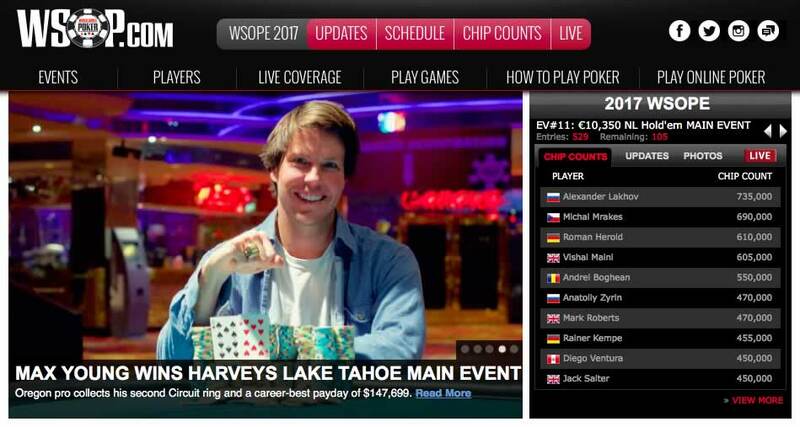 The World Series of Poker Circuit Lake Tahoe Main Event starts tomorrow at Harvey’s. $1,675 entry with flights at 11am Friday and Saturday. Mid-States Poker Tour Denver Poker Open $100K GTD kickoff event kicks starts today with $360 entry flights through Saturday. The Venetian Deepstack Extravaganza IV is bursting with events for the next few weeks, including a $200K GTD this weekend ($1,100 entry) and a $300 Survivor on Friday night (pays $2,500 to 10% of the field, with $12K GTD). The LA Poker Open starts Friday. Next week features PLO (Tuesday at 5pm, $350), a NLHE 6-Max at noon on Wednesday with PLO8 at 5pm (both $350). Thursday is a $570 Big O game! Next Thursday at Planet Hollywood is the WSOPC Las Vegas opener, a $365 Ring event with six entry flights (noon and 4pm, Thursday–Saturday) and $200 GTD. The Main Event ($1,675) has $1M GTD and starts 17 November. The Lucky Chances 19th Annual Gold Rush in Colma (south of San Francisco) starts 12 November and features six events with 1st-place guarantees ranging from $10K to $100K for the Main Event ($1,080 buyin, starts 18 November). Due to Halloween and paying bills activities, the Planner will be posted late today.